It’s all covered here; Chase HQ Arcade, Chase HQ Spectrum, Chase HQ Amiga, Chase HQ Genesis, Chase HQ Master System, Chase HQ C64. All of Chase HQ, in all it’s glory. Man, I’ve been wanting to talk about this game for over 2 decades. 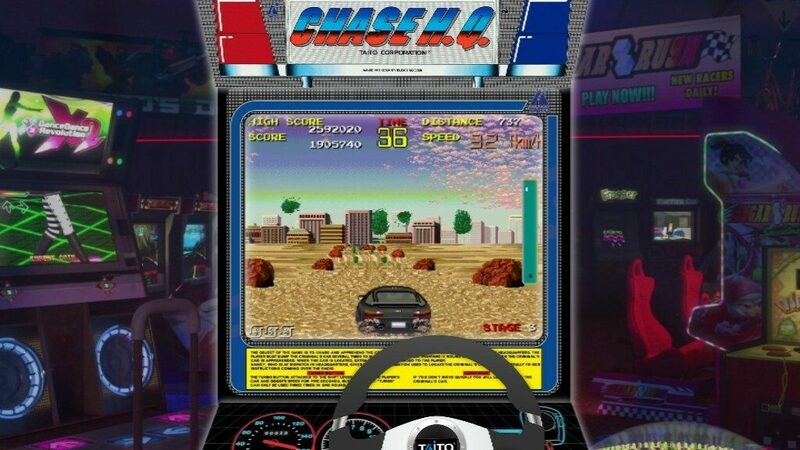 Chase HQ is by a significant margin, my desert island arcade machine of choice, regardless of the fact that you can complete it in 10 minutes with some skillful playing. 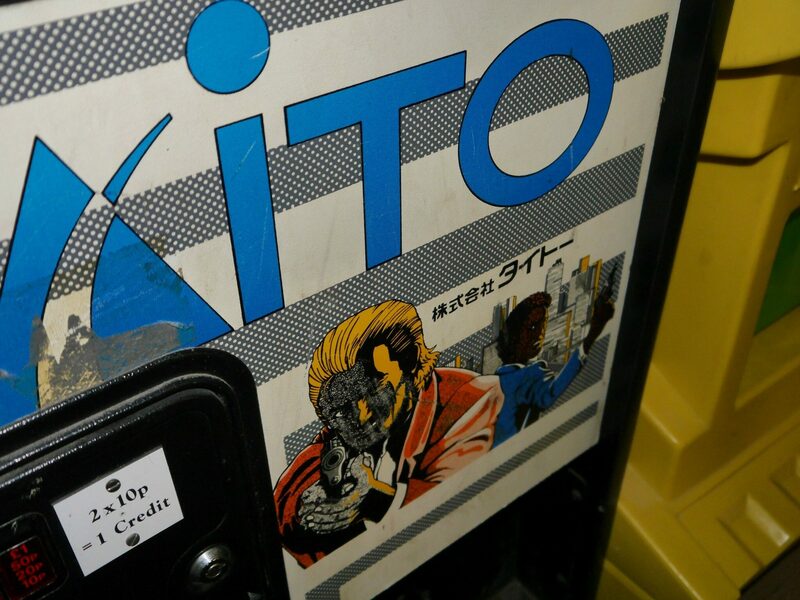 During the late 80s Taito were firmly in their golden period, with releases of Arkanoid, Bubble Bobble, Darius, Rastan, Rainbow Islands and Operation Wolf to name a few. 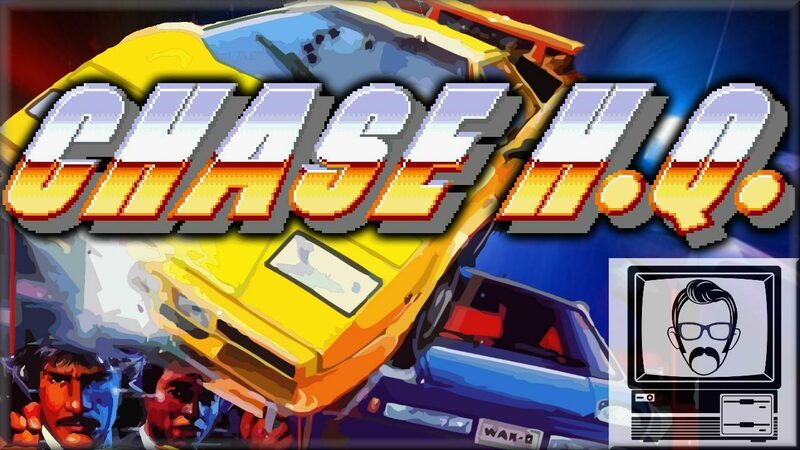 Chase HQ formed an essential part of that period, released in October 1988 and designed by Hiroyuki Sakou, the game shares graphical similarity with Sega’s Outrun, but with various enhancements including perspective, hill presentation and the continuity of track splits. 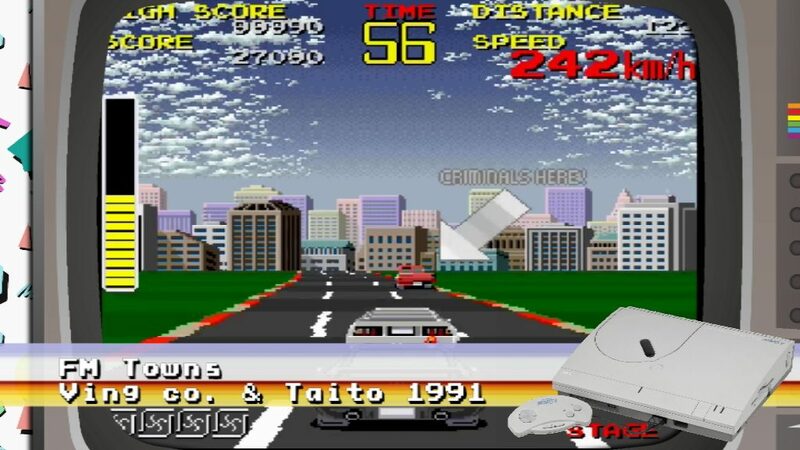 The hardware used wasn’t too dissimilar either, utilising Taito’s Z-System which shared the same dual Motorola 68000 graphical and Z80 sound processor setup as the Sega Outrun board and allowed 5 graphical layers and advanced sprite scaling & rotation. 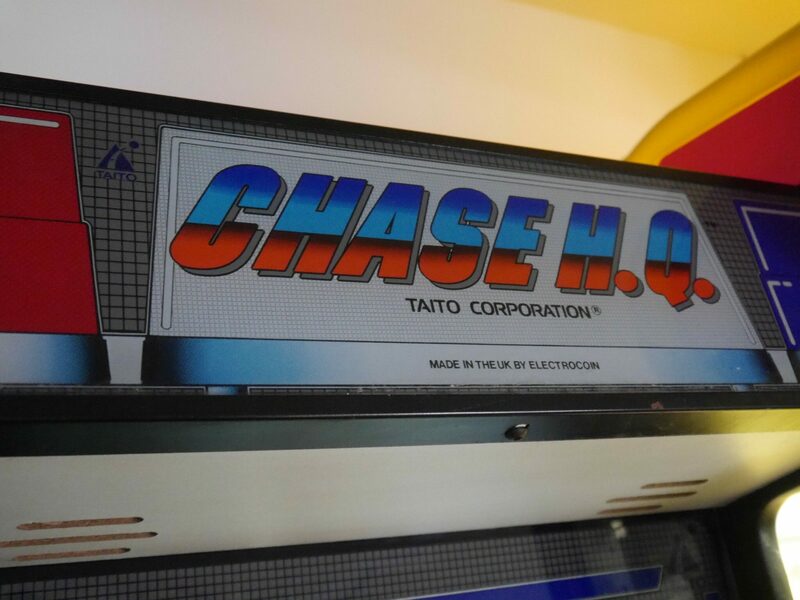 To many, Chase HQ is the spiritual successor to Taito’s Full Throttle – known as Top Speed in some regions. 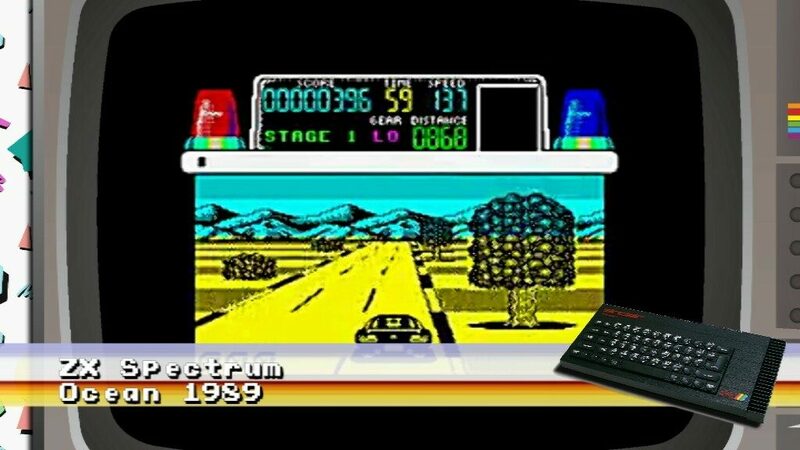 This game was the inspiration for the turbo button and although a pure racer was graphically similar to Chase HQ but based on older Top Speed hardware, also used for Operation Thunderbolt. 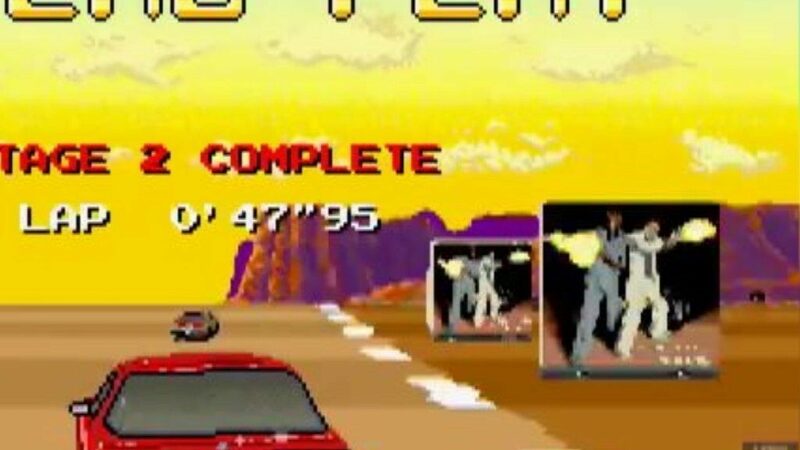 If you look closely at billboards in Full Throttle you can see clues already emerging for Taito’s next game digitised from a Miami Vice press image. 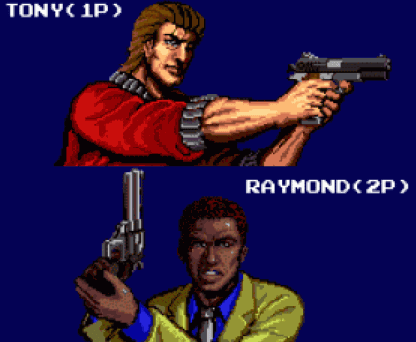 Rather than Crockett and Tubbs however, the lethal weapon morphed Manhattan cops of Chase HQ go by the names of Tony Gibson and Raymond Brody. 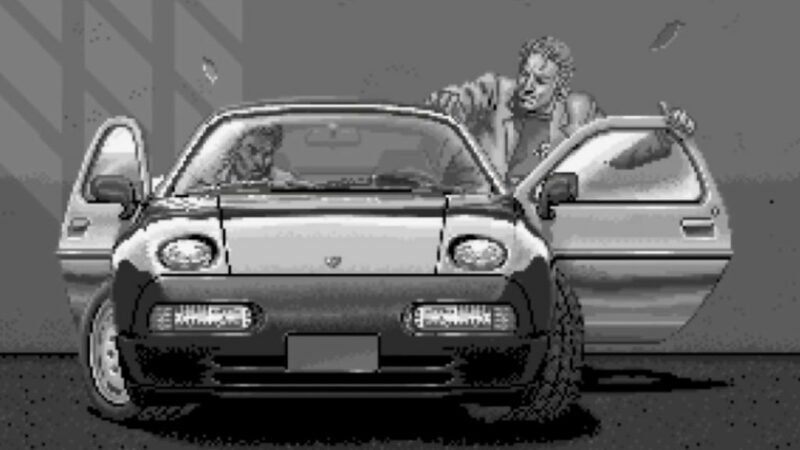 Working in the special Chase Unit, the undercover vehicle and also weapon of choice for this duo, is a rather sleek Porsche 928, essential for catching those speedy European sports cars driven by criminals of vice. Chase HQ sees you hunting down lawbreakers in high performance sports cars, with the objective of ramming these deviants of society off the road once you’ve caught up with them. 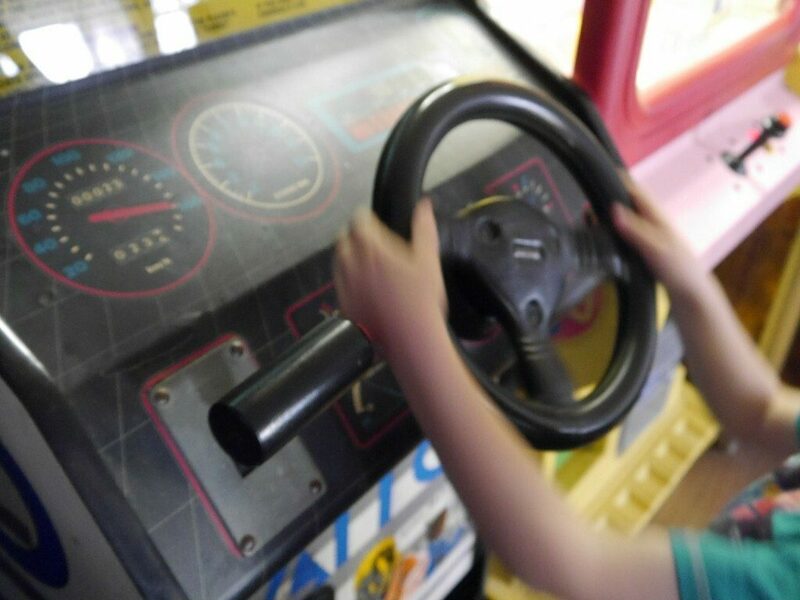 You get 60 seconds to tear through the course and find the offender, with another 60 seconds to smash them off the road. Where the road allows, the 3 turbo boosts at your disposal provide useful 5-second gap closers if you fly off the track, ram the criminal too hard or just misjudge your timing, take the longer route and have some catching up to do. 20 pence in the slot would provide you with your first credit – which if you were well seasoned, could take you to the end of the game, given the games gracious difficulty curve. 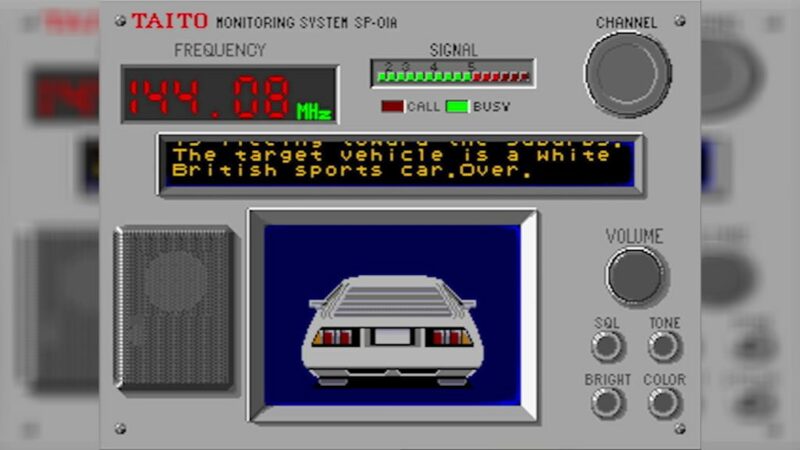 Each mission is radioed to you by Nancy at Chase Head Quarters who proceeds to fill you in on the suspect you’re chasing and his car of choice, starting with the Idaho Slasher in a white Lotus Esprit – which although not implicitly named is evident from it’s look and the British description. You get a map depicting a somewhat vague “Street lined with large buildings”, Brody then fills you in with some words of encouragement, and you’re off, gear lever in one hand, wheel in the other. 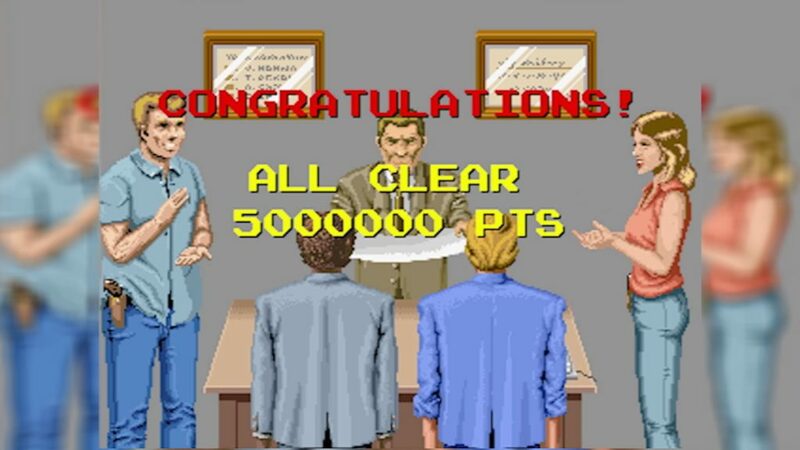 From this point, you experience something that only the arcade cabinet can really produce. It’s like all those 80s cop chase sequences combined into one hands on experience. There’s a sense of euphoric coolness. The graphics, music, engine sounds and digitised speech all add up to provide a visceral excitement of speed and determination as you race against the clock to catch up with your assailant. Take too long and he’ll get away. Catch up with him and you get a time extension to smash him off the road. At it’s heart, the game is still an against the clock racer, but this time, you have a mission, a purpose, and when you reach your purpose, you have the additional dynamic of manovering your car to cause as much damage as possible without negatively impacting your speed. Observe the massive “Criminals here” arrow, listen to Brody’s almost giddy enthusiasm, fill the damage meter until the car is on brink of a nasty explosion and jobs’a’goodun. You can apprehend your suspect (possibly Robert Di’nero) and read his rights (is that the voice of George Taki?). Given these vigilante tactics, you might assume that this is a world where the police require policing, but let’s not get too metaphysical in this world of pixelated police. To add variety, you’re also faced with a number of track splits, accompanied with guidance on the quickest route. Often these shortcuts take you off road or through a wider variety of obstacles, but navigate these successfully and you’ll shave a few seconds off your chase time. Throughout this the graphics aren’t too shabby either. Providing a variety of on screen and rotating sprites, roadside objects, vehicles and road situations, including that epic sparking tunnel on level 1. The point at which you know you’re almost on top of the Slasher himself. Although the game doesn’t vary much, and is pretty short with just 5 levels and a 2 minute timer for each, it’s one that I’ve never tired of, although I’ve yet to play on an elusive sit down cabinet, with standing versions far more common. One thing of note is the flashing siren lights on some cabinets which really bring the game out of the screen for an authentic experience. 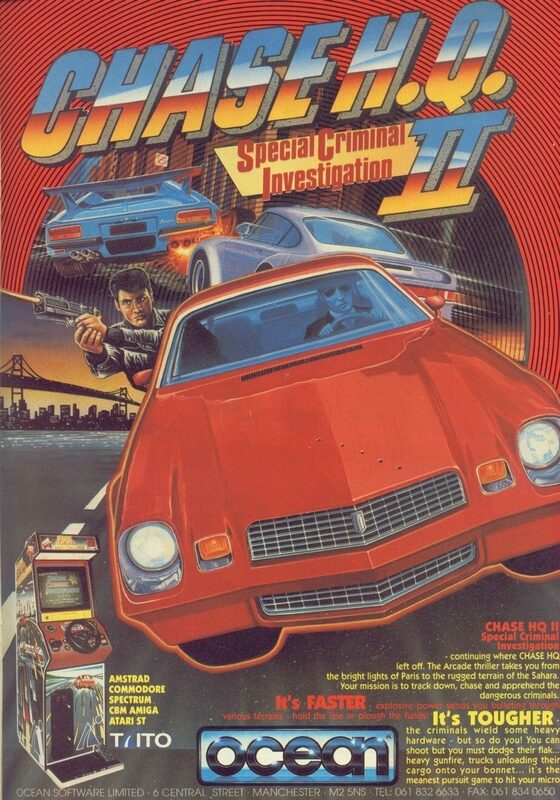 Level 2 sees you chasing down Carlos, an armed New York robber in a yellow Lamborghini Countach. Level 3 are the Chicago Pushers in a grey Porsche 959. Level 4 is an L.A. kidnapper in a blue Ferrari 288 GTO. You’ve gotta hope the victim isn’t stashed in the boot, for Christ’s sake. and Level 5 is the Eastern Block Spy in a very evenly matched red Porsche 928. Given that 928’s have a front engine, it’s surprising you never come off worse in these chases, but then I guess that’s down to your professional police training; apparently consisting of ramming from the go. Some of these guys were probably looking for a place to pull over until we started smashing them frantically from behind. Of course, such a classic experience wouldn’t be right without a slew of home conversions and Chase HQ is definitely not lacking in that department. Although for some reason, I never managed to get hold of one in my youth. You couldn’t exactly flick on the internet, fire up Amazon and order a game back then. You either had to scour magazine adverts, or head out on foot and check out your local Woolies, and for some reason I never knew about any of the ports until I’d been blessed with a Sega Mega Drive, and of course it’s probably the only machine I owned that didn’t see a European release of this classic racer. But looking back, as with most ports, it’s a bit of hit and miss depending on your platform. The main versions which stand out at the heralded Z80 releases, handled entirely by Ocean and released in 1989, with programming work falling to the dutiful Jon O’Brien and graphics by Bill Harbison. Jon’s efficient programming allowed for animated titles, synthesised speech and even a satisfactory end of game sequence. The game itself was also reasonably paced and fun to play on MSX, ZX Spectrum and Amstrad CPC ports, a far cry from the Outrun conversions forced upon players just 2 years prior. The story is sadly reversed on the Commodore 64, also released in 89. It feels like a badly strung slideshow more than anything else, with spine stabbing sound effects and a general desire to euthanize ones self provoked throughout. The same year also witnessed the Teque developed Atari ST version, and the rather lazy Amiga port with identical graphics, but I have to say, much improved music and actual in-game sound effects. Although not universally well received, this version would have satisfied the pants off me had I owned itback in the day. The frame rate isn’t great and the controls a bit spongy. But who the hell cares. It’s still unmistakably a playable Chase HQ. The Famicom version came next, which plays well in an 8 bit console arcade conversion sense, but never made it outside Japan. The 1990 Sega Master System version had similar smaller sprites, but also a certain amount of charm, making use of the systems increased colour palette. It lacks road undulation, but like it’s Famicom counterpart features a car upgrade shop between levels to add a bit of spice to proceedings. Being a game perfect for a quick blast, the Game boy was also blessed with a conversion, albeit with a fairly intense difficulty curve and repetitive landscape. It also featured different criminal names or crimes such as “Ralph the car thief”, “Antonio the Foreign Terrorist” and “Tyrone the Wanted Criminal”… I mean, you know this was a lazy port when they couldn’t even conjure up a reasonably felony for the last offender. 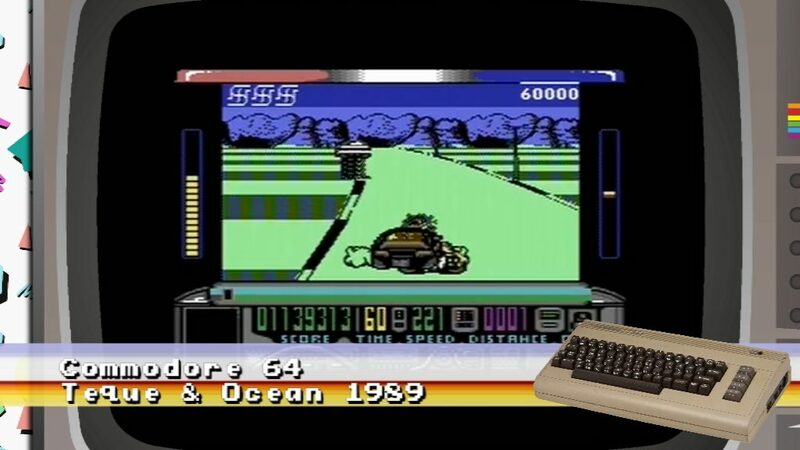 Although the West received numerous ports, the game is much more apportioned in Japan. 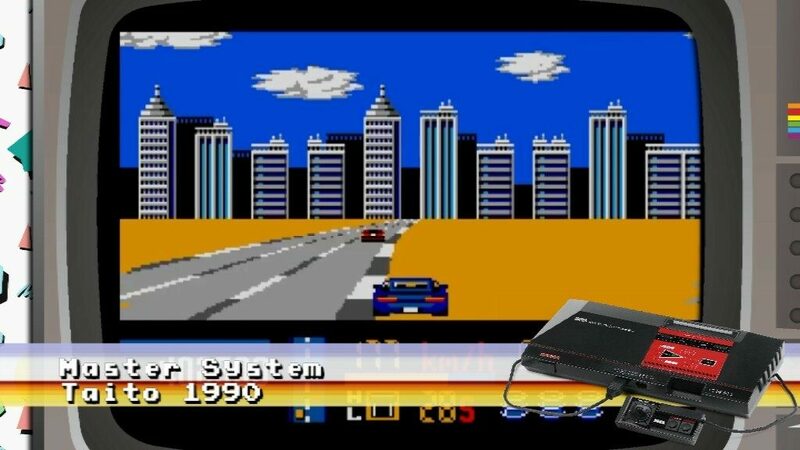 You’ve got the decent Japanese machine conversions on the PC Engine and FM Towns, alongside the slightly strange looking Sharp X68000 version, but also Super Chase HQ on the SNES featuring a first person perspective view point and to rub salt into the wound, a jump straight to Chase HQ II on the Mega drive, which although also available in North America is really just a twist the original arcade game, featuring a choice of vehicles and different levels. 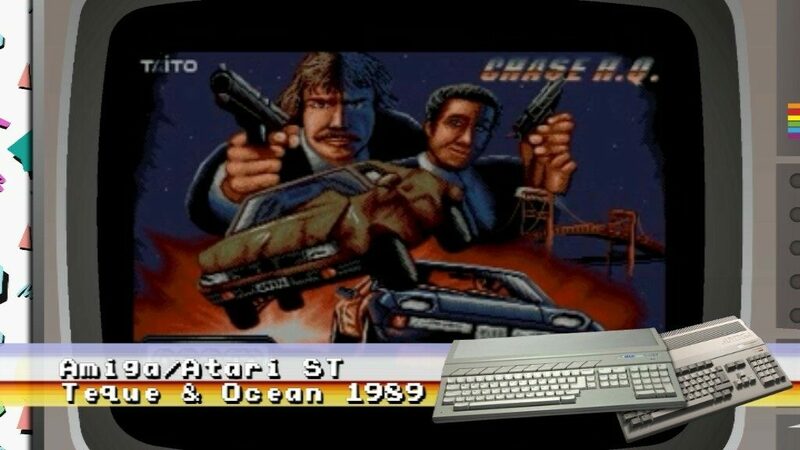 The progression of Chase HQ to it’s sequels is a strange and littered one, with most people acknowledging the gun touting 1989 Special Criminal Investigation as the original arcade follow up, especially Ocean who intentionally added Chase HQ 2 in front of the home port titles. 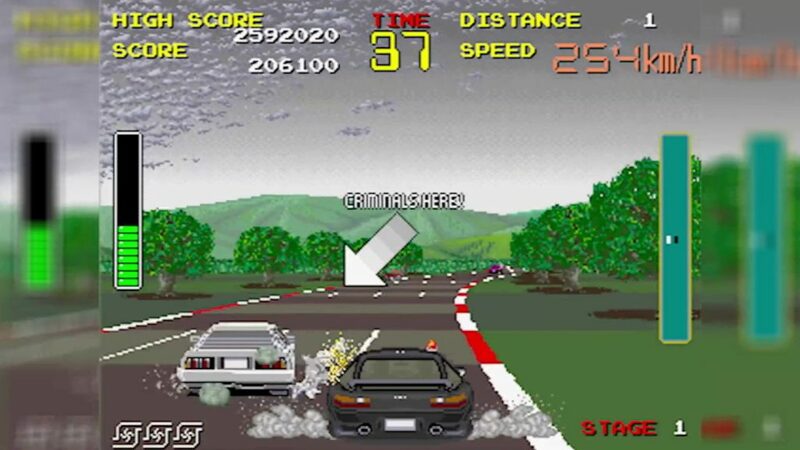 But Taito would also release the fairly rare Super Chase: Criminal Termination (forming the inspiration for the SNES game) in 1993 and to confuse things further, an officially named Chase HQ 2 to arcades in 2006. Various other spin offs arrived on home machines in-between including Chase HQ Secret Police on the Game boy Color in 2000 and Taito’s Ray Tracers for the Playstation that was described as a loose follow up to the game, featuring very similar gameplay. 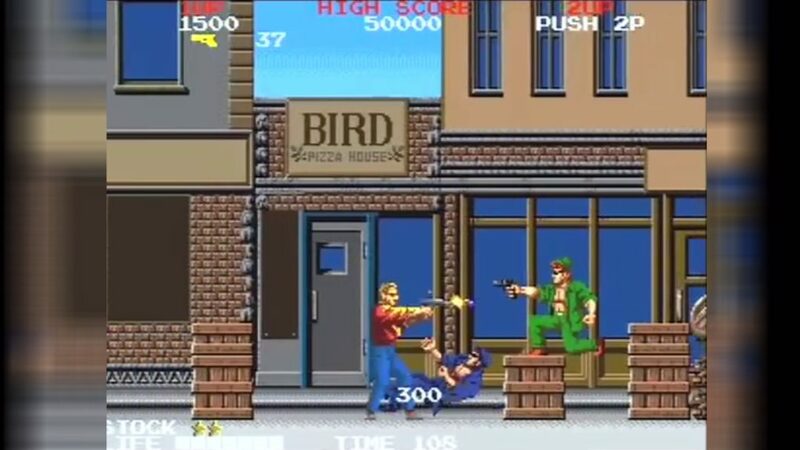 Taito also released an arcade spin off called Crime City in 1989 which sees Gibson and Brody team up for some street level brawling action. Still for all these sequels, spin offs and conversions, this is one game which only really holds up for me in the original arcade format. 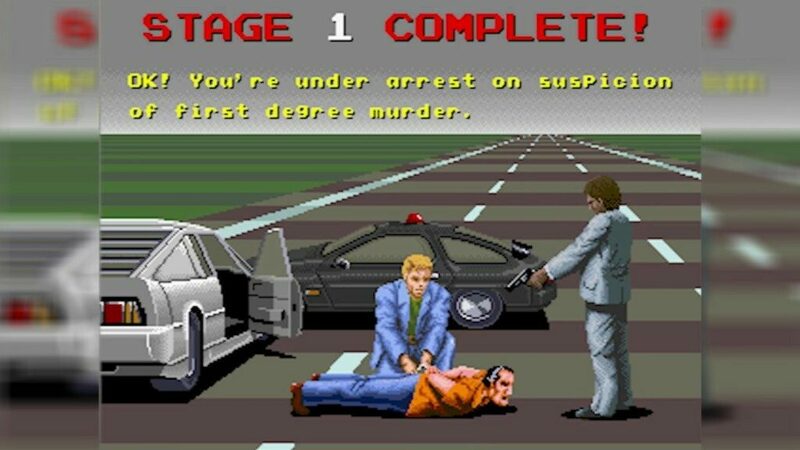 I mean I liked Special Criminal Investigation as well, but there’s nothing like the simplicity, the excitement and the coolness of the original that has since been captured in the racing genre. It’s hard to find a working cabinet today, but at least do yourself the honour of firing it up on Mame and having a blast.